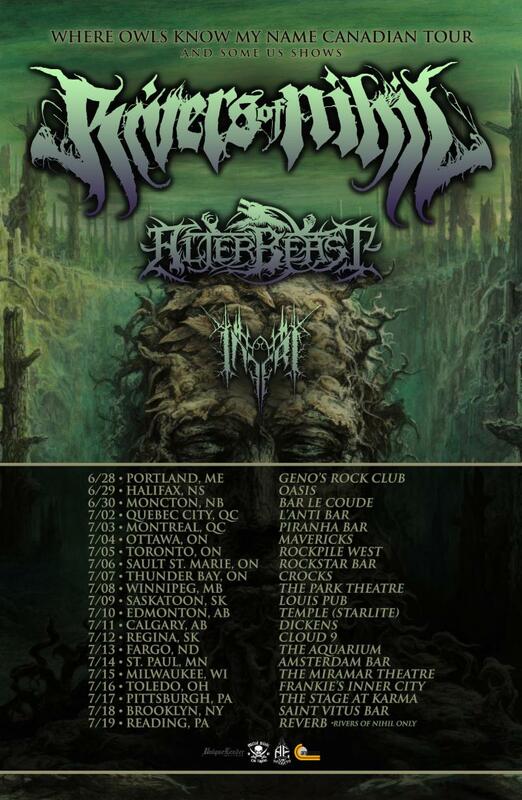 Currently wrapping up their stateside tour with Dying Fetus, Thy Art Is Murder, Enterprise Earth and Sanction, RIVERS OF NIHIL will take to the streets again this summer on a Canadian headlining trek (which includes select US shows) with Alterbeast and Inferi. RIVERS OF NIHIL will be touring in support of their new album, Where Owls Know My Name, which debuted on the Billboard and Canadian music charts upon its release: #3 Top New Artist Albums (Billboard/US), #9 Current Hard Music Albums (Billboard/US), #57 Top 200 Current Albums (Billboard /US), #61 Top 200 Albums (Billboard/US), #50 Top 200 Chart (Canada), and #10 Top Hard Music Charts (Canada). Named, "one of the best progressive death metal albums in years," by Heavy Blog Is Heavy and one of, "2018's best metal albums...so far," by Loudwire, Where Owls Know My Name can be previewed and purchased at: metalblade.com/riversofnihil.